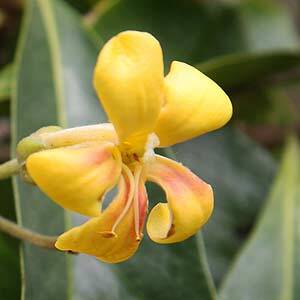 The name ‘Native frangipani’ is given to Hymenosporum Flavum purely because of the fragrant yellow to white flowers. Some forms have attractive orange flowers streaked with red. H. flavum is is found on the east coast of Australia in NSW and QLD. It will grow to 25m and more in the more tropical climates, in cooler areas its growth is restricted somewhat. Also widely grown in Perth, it is possible to prune these trees to keep them as a more bushy plant. It is a fast growing tree and responds well to pruning. Good glossy green foliage and masses of flowers in spring make this an excellent plant for full sun. 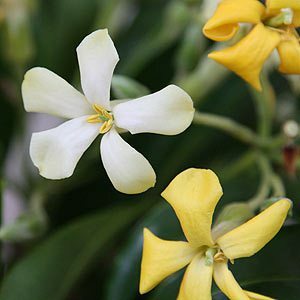 Native Frangipani is used widely in landscaping, with its fragrant flowers during spring and deep green foliage it makes a nice specimen tree in an open sunny position, although they will tolerate some shade. A humus rich well drained moist soil will see these plants thrive. Full sun is best especially in cooler climates where they may struggle in shaded areas. Fertilize with a native plant fertilizer in spring and again in early summer, water well before and after fertilizing. Stake young plants to ensure a good upright growth. As a plant, this one is really unique, it is the only species in the genus. And no it is not related to the ‘other’ frangipani. You can prune Native frangipani after flowering, this keeps the plant at a good size and promotes a bushy habit that will give more flowers. Older plants will generally respond to hard pruning. So if needed you can prune back into old wood to reinvigorate and reshape the tree. Height – 10 to 15 metres depending on soil and climate. Easily pruned to a lower growing bush. Spread – 5 to 7 metres depending on pruning. Position – Best grown in full sun for best flowers.